The folks of the International Pole Sports Federation would love for pole dancing to be in the 2016 Olympics. Recently, the IPSF held an "Olympic Exhibition Event," and, according to their website, "pole sports athletes across the world are ready to get their sport recognized by the greatest sporting event in the world, the Olympic Games." In an interview with Buzzfeed, Timothy Trautman of the IPSF said that having pole dancing in the Olympic Games is the only way for people to realize that pole dancers are incredible athletes: "They have such grace and elegance and they absolutely belong in the Olympics. But we do fight the stereotype that it's for strippers." Having attended a competitive pole fitness event myself, I will argue that pole enthusiasts are unbelievably strong, flexible and fit. There's no doubt that they are athletes. But when it comes right down to it, with all the splayed limbs, wide-open splits and crotches as the center of attention, pole sport will have a tough time going truly mainstream. In many societies, between-the-legs is still a no-no place, instigating snickers and "naughty" thoughts. 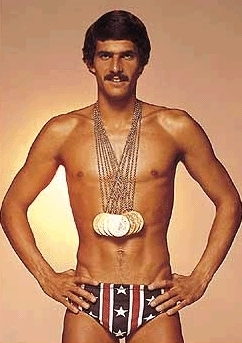 When it comes to displays of strength in the Olympics, the look is mostly conservative: Most of the the competitors in women's gymnastics wear long sleeves; the men's volleyball players do not go bare-chested; swimmers are covered to the knee, which makes Mark Spitz's retro swim trunks look tiny. And yeah, folks still associate pole work with stripping, even though stripping is about taking clothes off. U.S. National Pole Dancing Champion Natasha Wang (in the clip above) tells the Huffington Post: "My stance has always been that while I support the pole community's efforts to get pole into the Olympics, I don't think the general public is ready for the sport yet on such a mainstream/public scale." ESPN blogger DJ Gallo argues that if table tennis, archery and sailing are sports, then so is pole dancing. Of course, he's not on the IOC.